Kiwa hirsuta is a crustacean discovered in 2005 in the South Pacific Ocean. 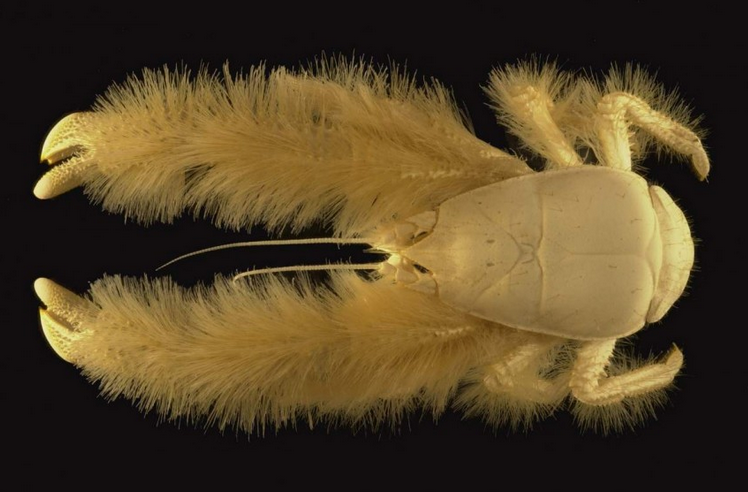 This decapod, which is approximately 15 cm (5.9 in) long, is notable for the quantity of silky blond setae (resembling fur) covering its pereiopods (thoracic legs, including claws). Its discoverers dubbed it the "yeti lobster" or "yeti crab"
The animal has strongly reduced eyes that lack pigment, and is thought to be blind. The "hairy" pincers contain filamentous bacteria, which the creature may use to detoxify poisonous minerals from the water emitted by the hydrothermal vents where it lives. This process is known as chemosynthesis. Alternatively, it may feed on bacteria, although it is generally thought to be a carnivore. Although it is often referred to as the "furry lobster" outside the scientific literature, Kiwa hirsuta is a squat lobster, more closely related to crabs and hermit crabs than true lobsters. The term "furry lobster" is more commonly used for the family Synaxidae.